Obama says, "I like to know what I'm talking about before I speak"
Editor's note: Ed Henry, CNN's senior White House correspondent, got a tough answer from President Obama when he asked Tuesday night why Obama waited days to express outrage on the AIG bonuses. "Because I like to know what I'm talking about before I speak," Obama said. Here's Henry's take on what happened. CNN's Ed Henry says he had several provocative questions prepared in advance of the news conference. WASHINGTON (CNN) -- The most amazing part of the exchange to me is that I didn't go into the East Room intending to ask President Obama about AIG. But none of them had much to do with the financial crisis because I assumed several of my colleagues would exhaust the topic of AIG before my turn came up. 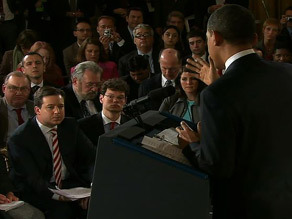 At the first presser in February, I was about the 10th reporter the president called on. The economy had been chewed over so I went with a "sidebar" question about whether Obama, given his push for transparency, would overturn the policy at Dover Air Force Base preventing media coverage of coffins returning from Iraq and Afghanistan. It was a surprise line of inquiry. The president made news by saying the policy was under review -- and a few weeks later he overturned it. I was heading into this event with the same strategy: make news on something unexpected (I won't tell you which topics I was working on cause it would ruin the surprise for a future presser or interview with the president). But on Tuesday night, as I sat in the front row nervously reviewing my hypothetical questions written out in longhand (decidedly old school), I kept thinking back to a conversation I had with Wolf Blitzer Saturday night at the Gridiron dinner. When you press a second time, you may be surprised with the second answer. And then rather than call on me 10th, the president called on me at about sixth. Still early, so nobody had asked AIG yet. Plus my "sidebar" question now seemed off-point so early in a newser focused on the economic pain in the nation. The pressure was on now because the president had called on me. Someone handed me a microphone, millions were watching, and it's scary to think about changing topic in a split second because you might get flustered and screw up. But it's fun to gamble and like any good quarterback (though I was never athletic enough to actually play the position), I decided to call an audible. So I went hard on the AIG question, and took Wolf's advice and followed on a couple of colleagues who got pushback from the president when they asked about how his budget numbers do not seem to add up. The president, like any good politician, decided to pick and choose what to answer. So he swatted away the budget question and ignored the AIG stuff. So I waited patiently and then decided to pounce with a sharp follow-up. From just a few feet away, I could see in his body language that the normally calm and cool president was perturbed. But it's in moments like that we sometimes find out what's really on a president's mind. In this case, he's not happy about the scrutiny on AIG. So he did slap me down a bit. Anderson Cooper said later half-jokingly that yours truly was "nursing his wounds." Invariably, my Democratic friends tweaked along the lines of "how'd you like the smackdown" because they were pleased the president pushed back. But my Republican friends hailed me by saying essentially, "Thanks for doing your job -- he never answered the question." What do I think? I've got no hard feelings toward the president and I assume he feels the same, but I can't worry about that. I was doing my job -- and he was doing his. All About Barack Obama • American International Group Inc.